I just finished reading a great book that a member of my PLN recommended (sorry I can’t remember who, let me know if it was you). 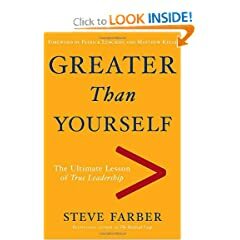 The book “Greater Than Yourself: The Ultimate Lesson of True Leadership” by Steve Farber is a quick read but could still have a profound affect on you. I will not spoil it for you, but the idea is how you can give of yourself to help make others better and at the same time help yourself to continue growing. There is an excellent part towards the front of the book that talks about social media and how it is increasing the idea of G.T.Y. (Greater Than Yourself). It immediately made me think about how I have learned so much and have grown as an individual and an educator with the help of my PLN from places likeTwitter. Without my PLN I would not have been able to attend the Google Teacher Academy in Washington DC. I hope that because of my growth I have been able to give back to my PLN by posting information to Twitter and being a lead learner at places like the Google Teacher Academy in San Antonio. I am hoping to further to the G.T.Y. mentality. If you get a chance to check it out I hope it will inspire you as well and I hope to be able to grow with you through the interwebs. I think you will like it. There is some information on how to keep balance at the end. The author does a great job of telling a story and at the same time of teaching the concept of GTY. I read it through an audio book I purchased at audible.com. I love how they can really bring the story to life, plus I can listen to it on my drive back and forth to work. The audio version was only about 3 1/2 hours.